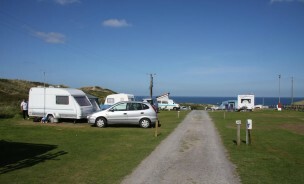 If you are looking for a beach campsite in Cornwall to make the ideal setting for your camping or touring caravan holiday, you need to look no further. Beachside Holiday Park, in St Ives Bay, has everything you need – combining all the freedom of your own space right by the sea with all the practical holiday park and campsite amenities you need close at hand. 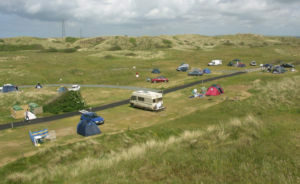 We offer touring pitches for caravans and tents complete with electric hook-up points, as well as camping pitches ideal for either caravans or tents without the use of electricity. 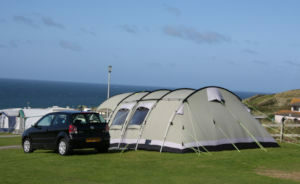 At our beach camping pitches in Cornwall, all pitches can be booked in advance of your stay and include free use of our up-to-date amenities consisting of temperature-adjustable hot showers, wash basins, WCs and an indoor dish washing room. We also have a chemical toilet disposal point and motorhome service point on the park. All other holiday park facilities are available, such as our outdoor heated swimming pool, shop, bar and games room. As a dog-free holiday park, Beachside provides a safe and relaxing campsite environment perfect for families and couples right on the beach in St Ives Bay, Cornwall. Perfect for large tents, our large camping pitches are found a short distance from our campsite and holiday park amenities.